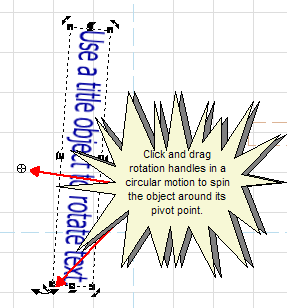 You can rotate an object around a movable origin (or pivot point) to create unusual effects. Rotating lets you turn an object on its side, upside down, or any other angle you choose. Code, text, table, or foreign objects may not be skewed. However, if you want to rotate text, add it as a title object. Be careful not to resize the title object, or the text may become distorted. The easiest way to rotate an object is manually in the Work Window using your mouse. With an object selected and the Object Edit button in the Components Bar activated, you can click and drag the object’s four rotation control points in a circular motion to rotate the object in either clockwise or counter-clockwise direction. You will know that your mouse is over you have grabbed a rotation control point when your mouse pointer becomes a double-sided curved arrow. As you drag, the angle of the rotation is displayed in degrees near the mouse pointer. An object will always rotate around its origin. In an object that has never before been rotated, you can find its origin in the center of the object. You can click and drag the origin anywhere in the Work Window. This will change the behavior of the object as it rotates. You can rotate an object to change its orientation. You can also rotate a selected object clockwise in 1-degree increments by pressing and holding the CTRL key while pressing the Right or Down arrow keys. Similarly, you can rotate a selected object counter-clockwise in 1-degree increments by pressing and holding the CTRL key while pressing the Left or Up arrow keys. When the Snap Grid is enabled, you can temporarily override the Snap Grid by pressing the Shift key while rotating an object with your mouse. For more information, see Snap Grid. You can reset a rotated object to it original orientation by pressing and holding the CTRL key while pressing the Left and Right arrow keys or the Up and Down arrow keys. If you require precision when rotating objects, you can use the X and Y Rotate controls in either the Object Editor or Rotation control the Quick Properties Editor. You can select an object to rotate, and then use the controls to adjust the rotation in 1 degree increments. For more information, see Object Editor Dialog Box and Quick Properties Editor Dialog Box . In the Work Window, select the object that you want to rotate. For more information, see Select Object. If you want to make broader rotation transformations, click and drag the object’s pivot point to another location in the Work Window. Click one of the four rotation control points that appear on the object’s bounding box, and drag it in a circular motion to rotate the object. You can rotate a selected object clockwise in 1-degree increments by pressing and holding the CTRL key while pressing the Right or Down arrow keys. Similarly, you can rotate a selected object counter-clockwise in 1-degree increments by pressing and holding the CTRL key while pressing the Left or Up arrow keys. In the Work Window, select the object that you want to rotate. Enter a rotation angle degree value (0.00 to 360.00 degrees) in the box. The object will be rotated to a new angle. In the Work Window, select the object that you want to move. Enter a rotation angle degree value (0.00 to 360.00 degrees) in the box. When you are finished, click OK. The dialog box will close, and the object will be rotated to a new angle.